Total 1 hr. 5 min. 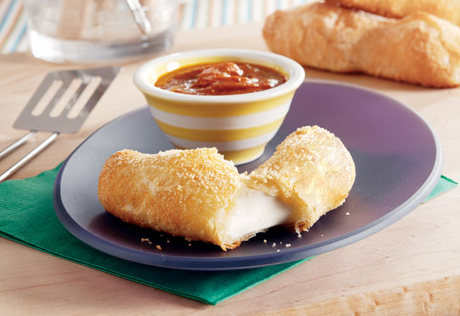 Here's a great way to dress up mozzarella sticks...just try this baked version that uses golden puff pastry as the "breading". You'll find that the melted mozzarella together with the flaky pastry is a delectable combination. Heat the oven to 400°F. Beat the egg and water in a small bowl with a fork or whisk. Place the Parmesan cheese into a shallow dish. Unfold 1 pastry sheet on a lightly floured surface. Cut the pastry sheet into 6 (5 x 3-inch) rectangles. Repeat with the remaining pastry sheet, making 12 in all. Heat the sauce in a 1-quart saucepan over medium heat until hot and bubbling, stirring occasionally. Serve the sauce with the sticks for dipping.